Grief has lots of emotions. Sometimes, when we experience it, all we want is to escape into nothingness, and so we climb into bed, pull the covers over our heads, and wait to drift away. Other times, we feel short tempered, irritated by the daily happenings that fill our days. We might feel exhaustion unlike anything we’ve experienced before, a heaviness making it difficult even to sit up. Or we might be energized by a mania that has us doing, doing, doing in an effort to avoid the pain which we are all-too-aware will be waiting for us as soon as we stop doing. Home is the story of a group of not-so-intelligent aliens who arrive on Earth, gather up all human beings so they can be relocated, and then begin the process of moving in. During the relocation, a seventh grade girl named Tip is separated from her mother. The movie follows Tip on her adventures as she is reluctantly partnered with a rejected alien named Oh and searches for her mother. During their adventures, Oh strives to understand the nuances of human relationships and emotions, and is especially confused about Tip’s expressions of grief. Tip repeatedly tells Oh about “my mom” and why it is so important that she find her. But Oh is unfamiliar with the idea of family and struggles to understand who this person named “my mom” is and why she matters so much to Tip. “Well, sometimes it’s both,” she says. And isn’t that just what we feel when we want our mom? When we can’t be with our mom? When we know our time with her is gone? We are furious with the circumstances, angry at those around us who cannot understand, and so darn sad all at the same time. It may not be anyone’s fault, but we want to find someone to blame. We think it might make us feel better, but it doesn’t. We are sad-mad. I’ve studied the work of Elisabeth Kubler-Ross who wrote in her 1969 book Death and Dying about the five stages of grief: denial, anger, bargaining, depression, acceptance. 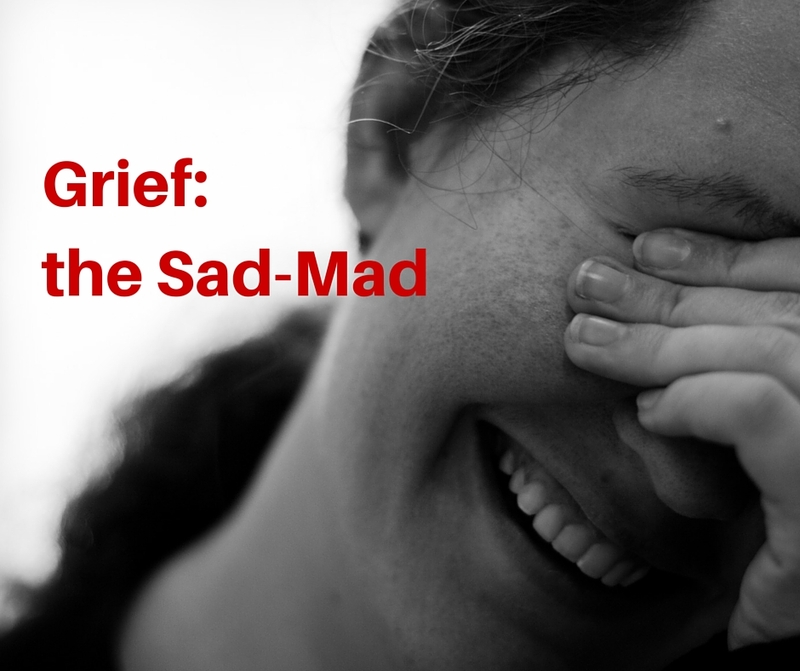 But right now, for me, “sad-mad” is a spot-on description of what it’s like to grieve. I believe that the sad-mad describes me. My Mother died suddenly in February and I am all of those things mentioned above. I am also an only child with out a father. To make things worse my youngest is graduating kindergarten and my daughter is graduating high school this month. My Mom was here for every recital, program, and event in our lives. My oldest kids are suffering and try to put in a happy face (21, 17 ages) for me. I know how much they are suffering, she was a second mother to them and we were her everything. I wish I knew how to stop their pain. I know we don’t know each other, but I wish we did because I’d like to be there to put my arms around you and let you cry. I hope you have people around you who let you do that. If not, seek out a community like Motherless Daughters Ministry (local or online) that can provide that for you. You are experiencing several major transitions/losses all at once. A support system of women who understand what it’s like is really important to help you with the grieving process for all the losses you’re experiencing–the loss of your mother and the ache of her not being with you and your children as they transition to new aspects of their lives, the loss of your daughter’s dependence as she becomes an independent adult, and the loss of your baby going into first grade. I will pray for you, Kelli, for strength when needed and for opportunities to let the tears fall and the anger escape. I am every bit of sad-mad. Losing a mother is an open wound that never heals. Shortly after my mom passed I tried to hide my grieve and got married 6months after but no time I became angry at my husband and ruin my marriage. Left with three younger sisters to care for, I blamed my sept dad and stayed away from him. I turned so bitter and empty inside hiding my true feelings pushing everyone who cares far away. No one opinion mattered just wanted her. I can’t make the pain stop but reading this is made realize I’m not alone. I am so very sorry for your loss. When we lose our mom, we lose her presence in our life, and we also lose a lot more than that. We lose her in our future–her advice, her hugs, her knowing-just-the-right-thing-to-do-to-pull-us-out-of-the-pit. I’m glad this blog helped you realize you are not alone. I hope you’ll see it as a door opening for you. There is healing available among the group of women who have gone through what you’ve gone through. I hope you will reach out and find the support you need — and deserve — whether that comes from connecting online with other motherless daughters, taking a class, studying a book, attending a retreat, or something else. I know that God created you with an abundant life in mind for you. And you are brave enough to fight for that. Your name says it all: you are Precious.